It is no secret that I LOVE shakers. And have been making since the beginning of my paper crafting endeavors. AND, I LOVE using sprinkles as my shaker element. So, today's project includes both! A shaker with sprinkles. But the twist is that it is not on a card, it is on a box. This cute little box is roughly the same size as a deck of cards, that is exactly what this box looks like in fact. So you can see that this shaker window is small. A tiny little shaker window. WITH SPRINKLES! I'm not even sure I can convey my excitement about such things in writing. He is pretty cute. And this was an easy ink blended background to make on a small piece of card stock. Then I stamped the top of the monster and accented the image with a marker and a white gel pen. I did save the die cut heart and added a sentiment to it so I had something cute to put on the back of the box. And my finishing touch was the handle made of matching ribbon. You can watch the making of this box below, and if you'd like to catch me LIVE you can find me every Monday night and Friday night at 8pm MST on my Facebook Page. If you have any questions about this project please ask and feel free to leave a comment below. Scroll to the bottom of this post to find links to all the products I used. All the fun Valentine gifts and decor are on full display every where you go. Recently I was walking through Walmart and saw some cute little stuffies for Valentines Day, they were little monsters. And so cute. So that is what inspired todays card. I pulled out my Eyes On You stamp set from Halloween and decided to use it to make a Valentine card. Below you can see the little monsters that sparked my creativity. I loved the pink and purple together and so that is the color scheme I used for this Paper Bag Envelope Card. For this card I started with a die set from Spellbinders called the Paper Bag Envelope. It is currently on clearance for $8.09! Which is a reason to love it, right! The top layer of my paper bag, the background, was die cut using one of the dies from this set. Then I used my True Color Fusion inks by FSJ to blend a background. Then I stamped the heart from the Eyes on You stamp set over the top of the blended background in the same colors as the ink I used. The ink colors are: Grape Fusion, Watermelon Fusion, and Bubble Gum. The insert for this Paper Bag Envelope is 3-1/8" x 4-7/8", I personally write this on the packaging for the die, so that each time I go to use this die I do not have to figure out what size to cut my insert. To color in my monsters I used my Zig Clean Color Real Brush Markers. These are a water based marker, that blend with each other. I used #084 - Deep Violet, #080 - Violet, #083 - Lilac, and #999 - Blender for the large monster on the front. I accented the monster in the card insert with #026 - Light Pink. One important think you want to take note of here, these markers work the best on Bristol Smooth card stock by Strathmore. If you have tried these markers and have not loved the result give them a second try on Bristol Smooth card stock and you will change you mind. I have also used these markers on image that have been stamped and embossed with black powder on watercolor paper and have loved the result as well. Below you can watch the making of this project from last nights Facebook Friday live demonstration. Scroll to the bottom of this post to find all products I used to make the projects link for you. Thank you so much for stopping by, I love sharing my creations with you and hopefully inspiring you to create as well. Affiliate Links have been used at no cost to you, thank you for shopping with me and allowing me to share what I love with you. The January Happy Stamping Box is available for order! You are invited to join me in creating some CUTE Valentine themed projects from the comfort of your own home with the Happy Stamping Box! The January box features the Valentine Pals stamp set and coordinating die set, heart punch, glittered foam stickers, sequins and printed paper. The theme this month is Valentines, but I have included a birthday card and a card that can be used as a thank you card as well. From this box you will be making 5 cards, with an opportunity to earn a BONUS 6th project for FREE! Each project is a unique creation designed by me. Some cool things we will be making are a shaker window card, a window card, a double z-fold card and if you earn the BONUS project, a shape card with pop ups! You are going to love these cards so much you might have a hard time giving them away! With the purchase of your box you will get an invitation to my private Facebook page, The Happy Stamping Box. Where you will have access to a printable PDF tutorial for the class projects. And this page is where the LIVE online class video will take place. Earn a 6th Bonus Project for FREE by ordering your January Happy Stamping Box by JANUARY 2nd or inviting a friend I have not to join. Just email me your friends name and you BOTH get the BONUS PROJECT! You will need to have some basic supplies on hand to make these projects. Below I have shared what I will be using. 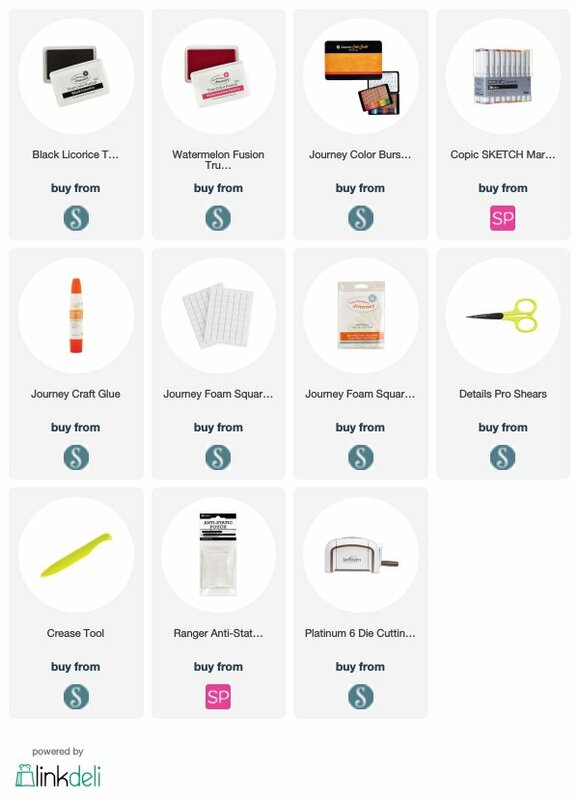 Feel free to use what supplies you have on hand or click to shop for exactly what I will be using, scroll to bottom for clickable links. Black Licorice stamp pad, Watermelon Fusion Stamp pad (bright pink), Markers or Pencils to color in your stamped images, Glue, foam squares, scissors, anti-static tool, crease tool. The January Happy Stamping Box class will be held LIVE in the private Facebook group on Saturday, January 26th at 9:30am MST. If you can not make the LIVE event the video will be available after the event in the Facebook group for 3 weeks for you to watch at your convenience. You will be added to the Facebook group about 1 week prior to the LIVE class. If we are not currently friends on Facebook please send me a friend request when you sign up for this class (Carrie Cady Rhoades) so I can easily add you to the page. Registration for the January Happy Stamping Box is now open and closes on January 4th. Your registration options are listed below with links to register via PayPal. Box includes: 5 project kits, Valentine Pals stamp set, Valentine Pals die set, Heart Punch, Silver Sequins, Silver Glittered Stickers, From the Heart Printed Paper sampler, accessories to finish your card, envelopes, access to the private Facebook group, access to the full color printable PDF. Box includes: 5 project kits, Silver Sequins sampler, Silver Glittered Stickers, From the Heart Printed Paper sampler, accessories to finish your card, envelopes, access to the private Facebook group, access to the full color printable PDF. <center?. /> All products for the kits will be ordered and prepared by me after the registration deadline, January 4th. I do not have all the product on hand, it is ordered when registration is complete. Class kit ordering, cutting and preparing take 10-12 days after the deadline. The expected shipping date for all boxes is January 18th. Registration ends on January 4th. The LIVE class is on Saturday January 26th at 9:30am MST. The recorded class will be available for viewing immediately after the live class is over for your to watch at your convenience for up to 3 weeks. After 3 weeks the video and PDF will be removed in preparation for the February Happy Stamping Box class. The PDF tutorial will post to the Happy Stamping Box FB page around 1/21/19 for you to print out and use along with the LIVE class. Everyone is welcome to join, new stampers, professional stampers, beginners, etc. Try out my Happy Stamping Box, I know we will have fun making! I have some very cute cards for you this month, you are going to be thrilled! Can't wait to create them with you! Clickable links to all the supplies I will be using to complete the cards on the live class are linked for you below. Feel free to sub in product that you already have on hand. Wouldn't you love to get a valentine in the mail? I think Valentines Day is all about how I can show love to the people in my life. And one of the ways I do that is with cards. I've heard it said a card is a hug with fold in the middle. Cheesy, I know, but and unexpected card can really put a smile one someones face and if it's hand made, yeah, that 's a hug! I wanted to show off a Gel Press print on book paper and this is the card that resulted. I never thought I'd use orange on a valentine card but I love the touches of orange in the book page background and the heart really pulls it out of the background. Have you heard of the Gel Press? It's such a fun and easy tool for making your own prints, it's one of my favorite things, so please let me know if you have any questions about it. I have done a few video's on it on my Facebook page, you can find that HERE. Thanks for visiting. I'd love to hear from you, your thoughts and comments make my day! The February edition of the Coach Collective is now available for purchase! Coach Collective is a collaboration of 12 Journey Coaches. We have each designed a project and created a step by step tutorial for this exclusive project. These 12 tutorials have been bundled together in one document. In the February edition of the Coach Collective you will get 12 exclusive step by step tutorials for these cute valentine projects that I know you are going to love! Take a look at the projects included. You can purchase your February Coach Collective Bundle HERE for just $15. Make a purchase of $45 or more at my On-Line Store between February 1 and 28, 2018, and I will send this tutorial as my free gift to you. JOIN MY TEAM, every one on my team gets the Coach Collective free each month. Find out more about becoming a Journey Coach HERE. NOTE: with all of these options I will email you the bundle directly, if you have not received the tutorial with in 12 hours of your online order or paypal purchase please feel free to contact me. If you have any questions about this tutorial please feel free to ask. I'd love to see your creations from this tutorial! Just two more days to get your January Coach Collective tutorial bundle. But I thought you'd like to take a look at what projects we have for you in the upcoming February Coach Collective. We have a new way to share these projects with you, in the form of a video. Check it out and let me know what you think! You can pre-order your February Coach Collective HERE. I will email it to you on 2/1/18. You still have two days to get the January Coach Collective! Valentine's Day is about one month away now! I think a few cute decorations are in order! So, for my Valentine's Craft Class on 1/20/17 we are making this cute Love Banner. This banner features the Sending Love Designer Paper from Stampin' Up! 's Occasions Catalog. I added a splash of glitter with the red glittered heart for the O in LOVE. But my favorite part of the banner is that it is reversible! You have a whole new banner. I like this because you can change it when you want a new look and you can hang it somewhere where it can be seen from both sides. It's a quick and easy decor piece to add some Valentine fun to your home. It would also make a great Valentine's Day gift! WHO: If you live in the Eagle, Idaho area, you are invited (or not, maybe you want a little road trip?!?). Beginner crafters, Advanced crafters and demonstrators are welcome to come play in my studio. WHAT: At this class not only will you get to make this reversible banner, but you will get to make 3 Valentine's cards and 3 Valentine treat bags. WHY: So you can have a night out of fun and make some Valentine projects that you will use to bring JOY to the ones you love. To register send your payment to me via PayPal by submitting to this email address: carrie@carriestamps.com, please note the option you choose. OR pay via check: email me at carrie@carriestamps.com letting me know the option you choose and I will email you back my address to send in the check. Please let me know if you have any questions about this class or the projects we are making. Thank you for taking time to stop and visit my blog. Looking forward to crafting with you! What better way to send your love than with a little treat! At my Valentine Craft Class we are making 3 of this treat bag, so you will have a cute package to put a sweet Valentine into. A cute tag makes all the difference on this gift bag. Fill this bag with some fresh baked cookies, brownies or your Valentine's favorite candy. And of course you can not go wrong with CHOCOLATE! This bag measures 5" x 7" when flat, leaving you plenty of room to fill it. The Mini Envelope from the Sent with Love Framelit set by Stampin' Up! is one of my new favorite things. I love it filled with hearts. My favorite heart is the stripped one, I used the same framelits set and die cut this heart from Kraft card stock to coordinate with the bag. I'd love for you to come stamp with me and make these cute treat bags! We will also be making 3 Valentine cards and a Love Banner! WHO: Beginner, advanced stampers and demonstrations alike are all welcome! And at this class you can choose to make more cards or more treat bags if you like. Here are your registration options. BONUS!!!!! Bring a friend I did not invite and get a FREE BONUS project! Your friend gets to make it too! Register by sending me your payment via PayPal to carrie@carriestamps.com, in the notes comment on which option you choose. You may also send your registration to me via mail. Just email me (carrie@carriestamps.com) your option # and I will send you my address. Thank you for taking time to visit my blog! Please let me know if you have any questions and I'd love to hear your thoughts, leave me a comment below. When you shop don't forget to pick your free Sale-A-Bration items! Join me for my Sealed with Love Valentine's Class! At this class we will be making 3 of the fun card you see here. As well as 3 Valentine Treat bags and a Love Banner. I will be sharing the other projects with you soon. This card is a little something special to send to some one this Valentine's Day. The touches of gold take this card over the top! Red glittered paper in a 3D heart! In the Eagle, Idaho area? Come stamp with me and have some Valentine Cards, treat bags and home decor piece done in one evening of fun crafting! Or email me your option and I will send you my email address to send me a check. Bring a friend I did not invite and you and your friend will get to make an additional BONUS project for FREE as my gift to you. Looking forward to another fun stamping event with you! Feels like Valentines Day has already passed around here. We have been busy crafting and baking. I thought I share some of our fun with you. The fun began with a Valentine making party for kids. We used the January Paper Pumpkin kit. If you are not a Paper Pumpkin subscriber, Paper Pumpkin is a subscription service. You subscribe and get a stamping kit delivered to your door every month. It is so much fun! I love rushing to the mail box and pulling out our red boxes (my girls get their own PP box too) and anticipation as we open it to see what the new kit is! Here's a video to show you the January Paper Pumpkin kit in action. I added some extra hearts to this kit so that each kid could make 30 Valentine pouches, as the kit alone makes 15 pouches. Here's how I did it. First I scanned one of the hearts and then saved it to my Silhouette Design Studio. From there I was able to trace and cut out as many hearts as I like using my Silhouette electronic cutter. I cut them from card stock, and used them as the backs for the cute stripped hearts from the kit. So, using the 30 stripped hearts from the kit and 30 card stock hearts that I electronically cut, each kiddo was able to make 30 valentine pouches. We made cookies to put in ours. Peanut Butter Chocolate Chip Oatmeal Cookies (flourless) to be exact. We had to cut a few of our chocolate chunks as they were a little big. Here are our Valentines all ready to go. I did put the cookies in a little plastic bag before putting them in the heart pouches. We also made our Valentine Boxes. Samantha wanted a puppy dog theme to her box. So we used some image from the Silhouette design studio and cut them with the Silhouette and adhered them to our wrapping paper covered card board box . Hannah wanted her box to be a Shopkin. So, we designed her box after her stuffed chocolate Shopkin toy. All done with card stock and punches. I used a gray marker to out line the edges of the white wrapper. As for the Valentines Party, it is pretty low key at our school. We belong to a homeschool Co-op. We go to school at home 4 days a week and on Thursdays we go to Co-op with other homeschooling families. At co-op we do Science, Art and Literature. And fun things that a lot of homeschool families might miss out on, like class parties. But we do them school wide. Here's how we do Valentines, each family makes a Valentine for each kid. Each kid has a box and gets a Valentine from each family. It was a fun day, as is every Thursday with our amazing school! Hope your Valentines Day is special, show yourself some love this Valentines Day! It's Mystery Challenge time, my favorite challenge at SSINK. I have been wanting to make a heart shaped card and so I saved it for this challenge. I embossed the Bermuda Bay piece with the Decorative Dots embossing Folder. The Pool Party piece I embossed with the Tiny Triangles embossing folder. For the Emboss Resist Technique I stamped the zebra stripped image from the Groovy Love stamp set in Versamark Ink on Whisper White Card stock. Then I heat embossed it with Clear Embossing powder. To add the color I used sponge daubers to rub the colors (Bermuda Bay and Watermelon Wonder) over the embossed image. The ink resists the embossed heart, such a cool technique. I added a touch of glitter with a Small Heart punched from Dazzling Diamonds Glimmer Paper. Thank you for taking time to visit my blog. I'd love to hear from you please leave me a comment and let me know your thoughts or questions, I am here to help! When you are shopping be sure to take advantage of SALE-A-BRATION, get free product for every $50 you order. 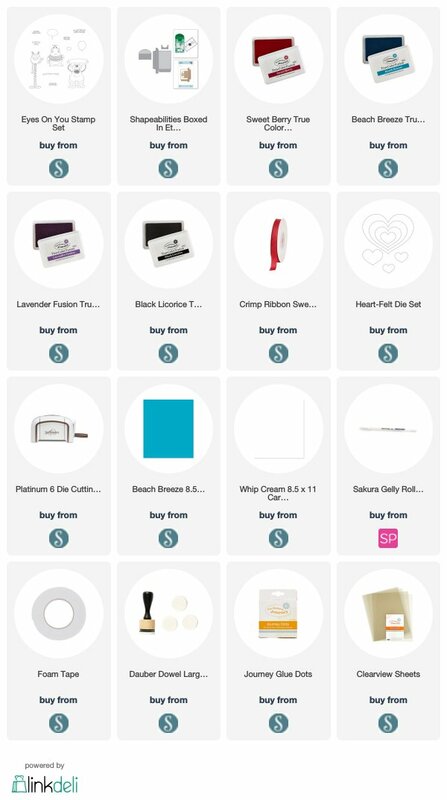 Look and pick out your items from the Sale-A-Bration catalog here and enter the code for the items you want at check out at my online store. IT'S MY VALENTINE STAMP CLUB! This month I am featuring the Love Blossoms Embellishment Kit. Each person will receive this kit to make the SIX projects we are making at the class. Today I will be sharing two of the projects with you. If you can not attend in person you can purchase a kit by mail. And keep reading to see how you can get this class for FREE! We will be making this mini Vintage Luggage case and coordinating Valentine Card. Another cool new product we will be using is the Blushing Bride Glimmer paper. I love it here die cut with the Bloomin' Heart Thinlit Die. My favorite is the Vintage Luggage case, which is lined with Designer Paper! If you like to join me for this class on Friday, February 5th at 6:30pm at my stamp studio in Eagle, Idaho you register here for just $24. If you would like a kit by mail you will need the following stamp sets and ink pads or you can improvise and use stamps and ink that you have on hand. GET THE CLASS FOR FREE!!!!! Pre-Purchase the GROOVY LOVE stamp set and the BLOOMING' LOVE STAMP SET and get the class for FREE (either in person or by mail)! You must shop with code: YWSSJJ47 to be entered before check out. Here are the codes to order the stamp sets. Once your order is placed I will email you to confirm your shipping details, so make sure you DO NOT click NO CONTACT or I will not be able to contact you or mail your kit! This picture shows you where to enter the shopping code YWSSJJ47 that you must use to take advantage of this deal. Make sure to enter the code before clicking check out! See my notes in red in the picture. When your order reaches $50 you will want to claim your FREE Sale-A-Bration items! View all the Sale-A-Bration offerings here. Or leave me a comment and let me know your thoughts, I'd love to hear from you. This week at Stampin' Royalty we have a color challenge. Good one for a Valentines Card! I used a current favorite stamp set, Groovy Love. Such a fun stamp set right! Great for Valentine projects and lots more. Like, Blushing Bride glimmer paper, Blushing Bride Sequin Trim, staples, Doily, Neutrals Prints DSP, punched heart border, and White Enamel dots. Just click on any of these items to view it in my online store. I loved layering all these fun accents onto this card. Texture, layers and embellishment are the way to my heart! Be sure to check out what my fellow Stampin' Goddesses have created for this color challenge and play along with us, we'd love to see your creations. Thank you for taking time to visit my blog. If you have any questions please let me know, or just leave me a comment, I love hearing what you think. When you are ready to shop be sure to claim your free SALE-A-BRATION items, pick one for every $50 you order.